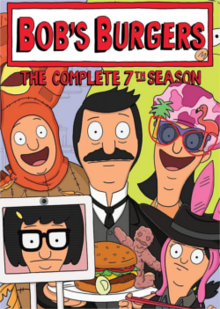 The seventh season of the animated comedy series Bob's Burgers began airing on Fox in the United States on September 25, 2016, and concluded on June 11, 2017. The season contained 22 episodes. On October 7, 2015, the series was renewed for a seventh production cycle, which premiered during the seventh broadcast season. Louise comes down with the flu and has a Wizard of Oz-esque fever dream involving a disfigured Kuchi Kopi and her toys, who have the voices of her family. Teddy tries to impress his ex-wife, Denise, when the Belchers accompany him for a ride on his newly restored boat. Meanwhile, Tina takes care of Bob's restaurant eraser, in an attempt to get her own cell phone. Tina seeks Mr. Ambrose's help in competing against Tammy in the Halloween costume contest. Meanwhile, Bob tries to figure out who is stealing his pumpkins. The Belchers find themselves in a full-blown investigation when Bob secures a new meat provider who claims to save clients money on their orders. Gene and Louise are on their own when a mishap sends Tina to detention, while Bob and Linda get into trouble with their accountant. Gene and Louise decide to sabotage the annual Thanksgiving play to save their long weekend, but Tina provides her fan fiction as the subject matter, leading the kids to work on their own version. Meanwhile, Linda finds a potato that resembles her deceased grandfather. Bob gets involved in a gingerbread house competition when Mr. Fischoeder asks him to bring food to his house. Meanwhile, Linda and Teddy take the kids caroling to spread holiday cheer. When Tina hurts her ankle, she is offered a chance to try a new technology that allows her to telecommute to school. Meanwhile, Bob gets a banjo and tries to find his perfect "banjo moment". As Valentine's Day approaches, the kids find themselves in love-caused chaos. Meanwhile, Bob attempts to impress Linda with a romantic gesture. When Bob finds out that Linda has secured a pet agent to fund the showbiz career of Gayle's cat, Mr. Business, he attempts to help the cat in getting his big break. Meanwhile, Gene and Tina secretly become obsessed with eating cat food. Louise must defend one of her biggest foes during a mock-trial at Wagstaff. Meanwhile, Bob teams up with Jimmy Pesto to oust a regular food-scammer. When Gene finds out that the formula for his favorite chocolate has changed, he attempts to resolve the situation with the company's head. Meanwhile, Bob gets involved in one of Teddy's not-so-perfect plans. After seeing Tina make a new friend, Linda begins invading her space at a heroine conference. Meanwhile, Gene and Louise give Bob the bachelor party he never had. When Tina learns that the Touch n' Sea Aquarium is in danger of shutting down, Gene and Louise decide to help her come up with a plan to save it. Meanwhile, Bob finds himself learning a few things from Linda's customer service skills. Tina unexpectedly finds success and a relationship with Henry when she is recruited by Wagstaff's debate team. Meanwhile, Gene and Louise convince Bob and Linda to help fund their stop-motion film. Bob and Linda's Easter egg hunt for the kids goes wrong when a missing egg becomes rotten and stinks up their apartment. Linda wins a dream weekend at the house where her favorite TV show is filmed, but her trip does not go as planned. Meanwhile, Teddy looks after the kids, but his bad back forces him to stay on the floor. Gene goes with Bob to the planetarium's final rock-and-roll laser show. Meanwhile, Linda, Louise, and Tina go out to dinner at a wacky restaurant, where Louise has a revelation. After Louise gets in trouble at school, Linda is forced to choose between following Wagstaff's policy or her own moral code. Meanwhile, Bob finds himself alone when Teddy decides to help a bunch of cyclists. Linda comes down with a cold and cannot attend the Mother's Day show at Wagstaff, so the kids decide to put on their version of the pageant for her when Bob's camcorder malfunctions. With the promise of an easy win, Teddy persuades Bob to enter the Bog to Beach parade float contest, despite the rainy weather that will occur on the day of the parade. When Bob finally realizes his dream of becoming an outdoorsman, he goes to a wilderness survival store that's going out of business -- and ends up locked there overnight with the store's owner, Austin (voiced by Rob Riggle). Meanwhile, Linda and the kids attend a rehearsal for Gayle's one-woman show and Linda and Gayle get into an argument over an encounter they had with Delta Burke. ^ Michael O'Connell (2016-06-16). "Fox Announces Fall Premiere Dates". Hollywood Reporter. Retrieved 2016-06-18. ^ Lesley Goldberg (2015-10-07). "'Bob's Burgers' Renewed for Seasons 7, 8". Hollywood Reporter. Retrieved 2016-07-24. ^ Porter, Rick (September 27, 2016). "Sunday final ratings: 'Once Upon a Time' and 'NCIS: LA' adjust up, FOX shows adjust down". TV by the Numbers. Retrieved September 27, 2016. ^ Porter, Rick (October 11, 2016). "'Once Upon a Time' adjusts down, final NFL numbers: Sunday final ratings". TV by the Numbers. Retrieved October 11, 2016. ^ Porter, Rick (October 25, 2016). "'Bob's Burgers' and 'The Simpsons' adjust down: Sunday final ratings". TV by the Numbers. Retrieved October 25, 2016. ^ Porter, Rick (November 8, 2016). "'NCIS: LA' and 'Madam Secretary' adjust up: Sunday final ratings". TV by the Numbers. Retrieved November 9, 2016. ^ a b Porter, Rick (November 22, 2016). "'Family Guy' and 'Bob's Burgers' adjust up, 'NCIS: LA' and 'Elementary' adjust down: Sunday final ratings". TV by the Numbers. Retrieved November 22, 2016. ^ Porter, Rick (November 30, 2016). "'NCIS: Los Angeles,' 'Madam Secretary' and '60 Minutes' adjust up: Sunday final ratings". TV by the Numbers. Retrieved November 30, 2016. ^ Porter, Rick (January 10, 2017). "'The Simpsons' and FOX adjust down, still above average: Sunday final ratings". TV by the Numbers. Retrieved January 10, 2017. ^ Porter, Rick (February 14, 2017). "Final Grammy numbers, plus 'AFV' and 'Dateline' adjust down: Sunday final ratings". TV by the Numbers. Retrieved February 14, 2017. ^ Porter, Rick (February 22, 2017). "'The Simpsons,' 'The Good Fight,' all others unchanged: Sunday final ratings". TV by the Numbers. Retrieved February 22, 2017. ^ Porter, Rick (March 7, 2017). "'NCIS: LA' and 'Time After Time' adjust up: Sunday final ratings". TV by the Numbers. Retrieved March 7, 2017. ^ Porter, Rick (March 16, 2017). "'American Crime' premieres low, 'Chicago Justice' fairly steady: Sunday final ratings". TV by the Numbers. Retrieved March 16, 2017. ^ Porter, Rick (March 21, 2017). "'Little Big Shots' adjusts up, 'NCIS: LA' adjusts down: Sunday final ratings". TV by the Numbers. Retrieved March 21, 2017. ^ a b Porter, Rick (March 28, 2017). "'Family Guy' and 'America's Funniest Home Videos' adjust down: Sunday final ratings". TV by the Numbers. Retrieved March 28, 2017. ^ Porter, Rick (April 4, 2017). "'Little Big Shots' adjusts up: Sunday final ratings". TV by the Numbers. Retrieved April 4, 2017. ^ a b Porter, Rick (April 25, 2017). "'Little Big Shots,' 'Bob's Burgers,' 'Last Man on Earth,' 'AFV' all adjust up: Sunday final ratings". TV by the Numbers. Retrieved April 25, 2017. ^ Porter, Rick (May 2, 2017). "'Chicago Justice,' 'America's Funniest Home Videos' adjust up: Sunday final ratings". TV by the Numbers. Retrieved May 2, 2017. ^ Porter, Rick (May 9, 2017). "'The Simpsons', 'NCIS: LA' and other originals unchanged: Sunday final ratings". TV by the Numbers. Retrieved May 9, 2017. ^ Porter, Rick (May 23, 2017). "'Bob's Burgers' and 'Family Guy' finales adjust up, 'AFV' adjusts down: Sunday final ratings". TV by the Numbers. Retrieved May 23, 2017. ^ Porter, Rick (June 13, 2017). "Stanley cup adjusts up, 'Funderdome' and 'Megyn Kelly' adjust down: Sunday final ratings". TV by the Numbers. Retrieved June 13, 2017.